Caitlyn's Blog | A child sings before it speaks, dances almost before it walks. A child sings before it speaks, dances almost before it walks. Throughout this semester, we were required to post to a blog our thoughts and opinions on the subject matters we chose. As you can see, I chose to focus my blog on dance and children. Because there is so much involved in the world of dance, I decided to focus on the things that interest me the most. Coming from a dance studio that strongly emphasizes the importance of ballet training, ballet has become a huge part of my life. 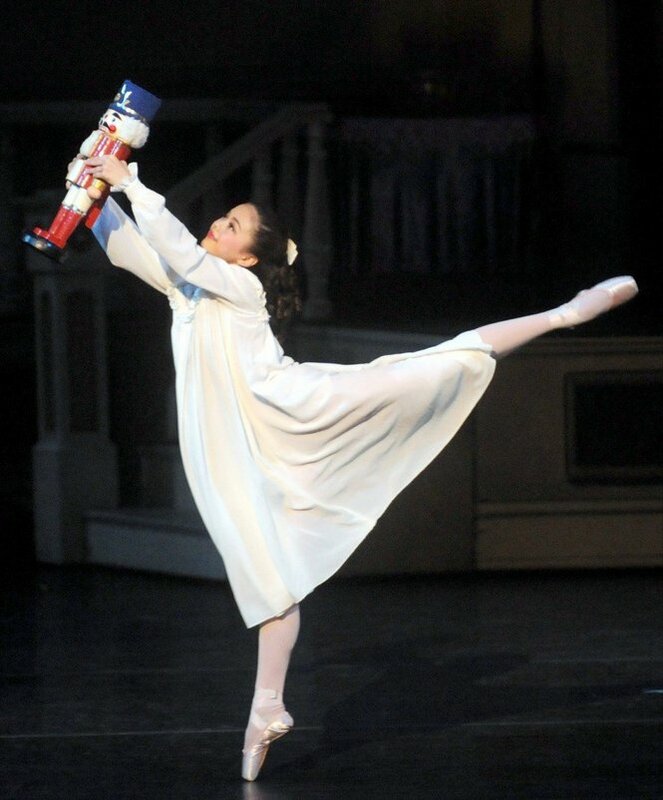 My first blog discussed the Grand Rapids Ballet Company’s Nutcracker performance. Since I was a child, I have religiously attended a Nutcracker ballet during the holiday season. I, actually, was often casted in it, but for the past few years, I have discovered the joy of watching the beautiful piece rather than performing in it. Later, I focused a different blog on pointe shoes. This blog was an informative article letting parents know when it is and isn’t okay for their daughters to get pointe shoes and why. So many parents enter the dance world without truly knowing how it works. They are often told that this is the way things are without getting a full explanation for the reasoning behind certain actions. I hope that this blog was able to give parents a better understanding about of qualifications their dancer must meet to receive their pointe shoes. My third blog post focused on the top ten YouTube dancers of 2010. I can openly admit that I am a YouTube fanatic and often watch it for inspiration for my choreography. Over the years, there have been certain dancers that have just amazed me with their technique and ability, and I wanted to share their gifts with the online community. Hopefully this blog will help these dancers to get the recognition their hard works deserves. While I did not abhor the blogging experience, it is not something I see myself partaking in, in the future. While it was nice to get my opinions and knowledge on certain subjects out to the world, I had a very hard time updating my blog on a regular basis. With my current schedule, I have very little free time in my life, and I often have a hard time writing when I’m in a rush. This strain often caused me to be stressed. So instead of relieving me of some of my pent up stress and aggression like I had hoped, bloggin seemed to add to it. While growing up, every child tries to find a way to define themselves. Most children become involved in some sort of extra curricular activity whether it be an athletic sport, music, drama, or dance; and they begin to define themselves by the well known stereotypes of each activity and their success within it. Jocks are expected to be tough and rugged, putting their physical success above their education; notable child musicians are labeled as child prodigies and presumed to practice their music for hours a day; young actors and actresses are trusted to be perfect role models for any fans they may acquire, expected to experience huge success, whether it be locally or nationally, and become “stars;” and competitive dancers are assumed to be comfortable with exploiting their sexuality and having an eating disorder while they maintain top physical condition. Society and the media often showcase and encourage these expected personality traits through popular teen movies and prime time television shows. A prime example of this is the movie “Mean Girls.” The entire plot of this movie revolves around high school stereotypes that, as stated by Fabiola Hernandez, “unfortunately hold true most of the time” (Hernandez 1). While producers claim to not be encouraging the practice of these stereotypes, the amount of influence that the media and society have over the children of today ultimately forces them to take on the expected characteristics of their activities. As a result, these highly impressionable children do not have to only deal with the developmental stereotypes placed up on them by society, but they also have to deal with the pressure of achieving the amount of success that they themselves, their parents, and their teachers wish for them to have. Many people within society associate success with happiness, and because of this, they want their children to be successful in whatever activities they choose to participate in. A parent entering a child into a soccer or football program wants them to become a part of a winning team, for they believe that joining a team that experiences more success will not only encourage their child’s confidence but will also increase their self-esteem. As time progresses, just being part of the team is no longer enough. Most parents will begin to want their child to become an “important” member of the team and have a bigger impact on the team’s success. If their child is often sitting on the side-lines or standing back and allowing the other team members to earn the win, they feel that their child is not getting everything they should out of playing the sport. They tend to believe that allowing others to control the situation and consume the spotlight can have a negative effect on their child’s self-esteem and form them into a “follower.” This assumption then leads to parents encouraging their child to work harder during practice and try harder during games, for they believe that is it necessary for their child to get their moment in the spotlight, whether it is something they want or not. A young athlete’s emotional response was further shown to be related to his or her perceptions of parental pressure by Hellstedt (1988). Hellstedt (1988) found that the “degree of parental pressure is related to the type of affective reaction from the young athlete” with high levels of parental pressure related to negative athlete response. The athletes were also shown to be apprehensive about how their parents would react emotionally, such as with disappointment or disapproval, when they did not perform well. In addition, according to these young athletes, continued sport participation was due, in part, to the desire to please their parents… (Gould 28). This study showed that children will often do anything they can to receive their parents’ approval. When a parent begins to imply that their child’s actions are not good enough, the child will often respond with stress and anxiety. Parents should be willing to accept their child’s ability levels as they are, for even if they are not the best on the team, they are learning to participate in a team activity and having fun while doing it. Being labeled as the “top talent” can also have a very negative effect on a child. Within the dance community, I seen quite a few instances where those children blessed with an immense talent are put under much more pressure to succeed than the rest. Growing up, I saw a few girls faced with this struggle; however, the experiences surrounding two of my studios current young stars, Mary and Jane, have definitely been the worst. Mary, started dancing competitively at the age of five and immediately showed an immense talent and passion for the art. She received her first solo at the age of seven and was able to acquire overall titles within her first competitive season. While these title were few are far between, Mary friend’s and family were proud of her no matter what her placement was. Jane had also experienced the same amount of success as Mary and had placed in the overalls at many of the competitions she attended. She, however, had a much harder time accepting the results when she did not win. At the time, we just blamed it on her young age and assured ourselves that as she matured the situation would get better. The next year, the expectations for the girls grew. Not only did we, the teachers, push them harder, but so did their parents. We had all seen the amount of talent the girls possessed, so we wanted to nurture their talent and train it to take them as far as possible. They were each given challenging routines and required to practice at least an hour a week. The number of solos they performed also grew, and they were now expected to compete with two solos instead of one. While the girls seemed a little stressed at first, they were beyond excited to be learning skills that the “big girls” did. They stepped up to each and every challenge, showing great enthusiasm when they achieved each new skill. When competition season came around, it was obvious that all of their hard work had paid off. Both girls were now scoring higher, winning more overall titles, and beating many of the girls they had placed under the year before. One would think that this would make all parties happier; however, that didn’t seem to be the case. Because the girls has passed up many of the dancers within their division, they were now becoming each other’s competition, and the parents were not handling the situation well. Jane’s mother began making comments to Mary stating things like, “Are you okay? Your dancing seemed a bit off today,” “You did really well, but I’m not sure it was you’re best performance,” and other back-handed comments that sent Mary’s mother into a rage. While Mary’s mother never said anything directly to Jane’s family, she encourage Mary to stand up for herself and not let Jane or her mother talk her down. This animosity and distrust between the parents soon transferred over to the girls. They were now not only competing against each other at the competitions, but they were also competing and comparing themselves against one another in the classroom. Jane, at the age of 8, went on a diet so she could be as thin as Mary, and Mary worked harder and harder every week so that she could achieve the new skill before Jane. Once the severity of their competitiveness became apparent, the teachers had a strict talk with the parents and the girls discussing how unacceptable their unsportsmanlike conduct had become. While the situation seemed to get better, the foundation of jealousy and mistrust had already been laid. Over the next two years, the girls continued to improve and grow. The animosity between the parents continued, but it was much more subdued. The girls attempted to be kind and encouraging to one another, but it was always apparent that the mistrust was still there. They put all of their focus and energy into their new skills and were now working on solos that placed them within the top five at every competition they attended. They were performing skills that many of the senior dancers struggled with, yet these girls, at the age of eleven, were executing them with ease. While this new skill level and understanding of dance seemed to be great for the girls and their future careers, it also made them much more self critical. Now that the girls were improving at a quicker rate, they were more given challenging skills that pushed them harder than ever. This new difficulty level did not often bode well with the girls, for they could often be found talking themselves down and getting tears of frustration when they could not execute a new skill right away. They would come in with their parents and practice their solos for hours, finding and correcting any mistake they may have made. They now knew the difference that “turning out,” not “turning out,” “emoting,” and “not emoting” could do for the scores, and they were determined to fix any possible mistake that could lead to a point deduction. The girls and their parents now expected to win, and if they didn’t, then angry parents and sulking children would be found after awards. Doing well and having fun was not good enough for them anymore. The girls had worked hard to achieve the level of a professional dancer at the age of eleven and were expected to win because of it. Dance had evolved into something completely different from when they had begun. While most of their passion for the art still seemed to remain, it was not longer just a fun hobby. It had become the most important thing in their life and their means of judging their own self worth. Another instance where stereotyping and the pressure to succeed can have a very negative effect on a child is in the entertainment industry. For years, people have heard about “child stars gone bad,” and all of the trouble these one time superstars have gotten themselves into; however, instead of parents addressing this viscous cycle, they continue to ignore it and subject their young children to the evils of the industry. Some of the most recent victims of this “child star” cycle have been Lindsay Lohan and Miley Cyrus. These two young women have continued to make front page news with their bad habits and sexual exposure. Cyrus has been accused of indecent exposure and been caught smoking a bong; while Lohan has been accused of excessive partying, gone through a series of car crashes, pleaded guilty to a DUI and cocaine possession, and has even spent time in jail (F. 1). Because of these actions, “List Verse” even named Lindsay Lohan as the “#10 Child Star Gone Bad” (F. 1). These two stars who have been a part of the industry since their pre-teen years, easily succumbed to the pressure that surrounded them. While society as a whole expected them to be the perfect roles models and maintain strict morals that their young fans could follow, the industry itself expected them to act like adults and be willing to “sell” themselves to improve their career. Another young star that has recently fallen subject to these pressures is Demi Lovato. While Lovato has not been in the lime-light as long as the other two, the industry still seemed to have just as bad, if not worse, effect on her. According to an article on “Music Agenda,” Lovato entered a “treatment center” on November 1, 2010 (Vena 1). It is claimed that she was dealing with minor “emotional and physical” issues; however much speculation on the severity of these issues has been made (Vena 1). MTV News stated that an, “unnamed source close to Lovato’s family revealed… ‘She fought through eating disorders and has struggled with cutting,” (Kaufman 1). While the exact reasons behind these actions remain unclear, it is believed that the pressures of society and past bullying had led Lovato to this point. Without the need to have the “perfect” body that society demands young female stars today, would Lovato have turned to an eating disorder? It is obvious that the answer to this question and others like it will never be known; however it is reasonable to conclude that the stereotypical image of the young, thin, and beautiful female star that Lovato was pressured to be did nothing but make her situation worse. Each of the situations above show what the pressure to succeed can have on a child and their emotional development. The children of today already have a hard time dealing with the pressures of society and the stereotypes forced upon them by the media that the added stress of parental and teacher approval can often take them to their breaking point. MedicineNet.com brought attention to this fact by reminding parents that even those children with extreme talent should not be burdened with the added pressure of success. They stated that, “Adults should not pressure a young child to focus only on winning even if exceptional [talent] is shown. A young [child] who might show natural talent in a particular [activity] must work hard and show [their own] dedication in order to succeed” (“Tips On Choosing A Sport For Your Child” 1). Forcing young success does nothing but compel a child to fall under the pressures and stereotypes that the media and society has placed before them. This causes them to believe that just being themselves is no longer good enough. F., Chris. “Top 10 Child Stars Gone Bad.” Top 10 Lists – Listverse. Jamie Frater, 19 Apr. 2009. Web. 13Dec. 2010. <http://listverse.com/2009/04/19/top-10-child-stars-gone-bad/>. Gould, Daniel, and Ryan Headstrom. Research in Youth Sports: Critical Issues Status. HYSA Home Page. Institute for the Study of Youth Sports, 2004. Web. 12 Dec. 2010. <http://www.hollistonsoccer.org>. Hernandez, Fabiola. “High School Stereotypes Explained. Associated Content from Yahoo! – Associatedcontent.com. Yahoo Inc., 12 June 2007. Web. 12 Dec. 2010. <http://www.associatedcontent.com/article/276956/high_school_stereotypes_explained.html?cat=25>. Kaufman, Gil. “Demi Lovato ‘Fought Eating Disorders, Cutting,’ People Reports – Music, Celebrity, Artist News MTV.” New Music Videos, Reality TV Shows, Celebrity News, Top Stories | MTV. MTV Networks, 02 Nov. 2010. Web. 13 Dec.2010.<http://www.mtv.com/news/articles/1651301/20101102/lovato__demi.jhtml>. “Tips On Choosing A Sport For Your Child – Exercise and Fitness Tips with Workout Routines, and Mind – Body Fitness on MedicineNet.com.” We Bring Doctors’ Knowledge to You. MedicineNet.Inc., 30 Aug. 1999. Web. 13 Dec. 2010. <http://www.medicinenet.com/script/main/art.asp?articlekey=10079>. Vena, Jocelyn. “Demi Lovato Reportedly Had Altercation With Dancer Before Entering Treatment | Music Agenda. Latest News about Music Artists, Top Dj, Music Trends and Celebrity. Music Agenda, 04 Nov. 2010. Web. 13 Dec. 2010. <http://musiclubber.com/demi-lovato-reportedly- hadaltercation-with-dancer-before-entering-treatment/>. 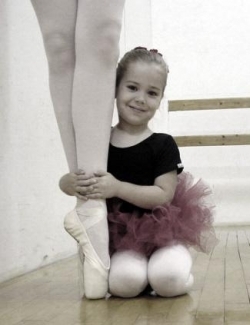 Almost every little girl experiences the dream of one day being a ballerina. Seeing the beautiful, graceful dancers wearing their glamorous tutus and twirling and leaping on their toes is something that brings excitement to their minds and joy to their hearts. Every parents wishes to fulfill the dreams of their child; however, when is it considered safe to allow young dancers the privilege wearing pointe shoes? This topic is something that causes controversy amongst many dance teachers, for some do not feel that the amount of safety precautions recommended is necessary. However, through experience and training, I can assure you that the precautions listed below are essential if you wish for your child to have a safe experience while learning the art of pointe. 1.) Receiving structured ballet training. 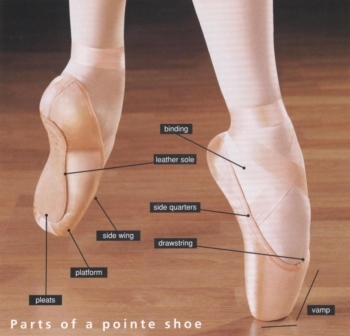 Before a dancer can be given her pointe shoes, it is important that her body, specifically her ankles and feet, is capable of safely supporting her frame on her toes. In order to achieve this strength and stability, a young dancer must go through the strict training of a highly structure ballet program. In most cases, the Cecchetti and Russian Vaganova formats are used. These programs include levels and grades that require the student to be professionally evaluated to pass from one level to the next. In the Cecchetti format, a council is elected to oversee the generally training of all of its students. The entire program includes eight grades, the first four designed for beginners and the second four for professional students. In order to be an instructor, a teacher must seek specific training for each grade, and then be evaluated on their skills to perform the grade, teach the grade, and their understanding of how each step conditions the body and improve the dancer’s technique. Once a teacher has passed, they will be given the privilege of teaching the grade to willing students. Once they feel their dancers have memorized the grade’s steps and learned to perform them correctly, they will be presented in front of a Cecchetti council board member and evaluated on an individual basis. If the student passes the exam, they will be permitted to train in the next grade level, but if they do not pass, the student will be prohibited from re-taking the exam for the next 18 months. This structured training is very important for young dancers. Not only are their bodies learning the correct ways to control their movements and prevent injuries, but they are also learning that the art of dance is a discipline, something that you must work for in order to reach your goal. If your child is interested in obtaining pointe shoes, make sure that they are receiving training under one of these formats. Professional teachers involved in these programs know when a child is or is not ready to safely take on the art of pointe. They will do everything they can to ensure that your child is receiving the correct training and that their safety is put first. 2.) See a foot doctor. Another necessary precaution for obtaining pointe shoes is receiving your doctor’s permission to train in them. Because an x-ray of your child’s feet will be needed, it is often recommended that you visit a foot doctor for this evaluation. 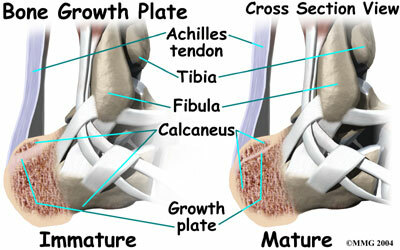 When you arrive, the doctor will take an x-ray image of your child’s feet and examine their bone development. If your child’s growth plates are open, the doctor will recommend that your child does not receive her pointe shoes at this time. This means that the dancers foot is still growing. If a child trains in a pair of pointe shoes before her growth plates are closed, it could cause irreplaceable damage to her feet. Again, safety is the most important thing when obtaining a pair of pointe shoes so we do not want to risk this sort of injury. Because the dancer will be her feet so often, it is very important that her feet are fully and naturally developed before she begins to train on them. Once your doctor does give the okay, you and your dancer are ready to buy her first pair of pointe shoes. 3.) Obtaining the correct pair of pointe shoes. When going to get your child’s pointe shoes, make sure that the dance store you are purchasing from has a staff member qualified to fit pointe shoes. Every child’s foot has a different shape, so they will need a different style shoe. Because there are hundreds of different brands and styles of pointe shoes, it is very important that you have someone guiding you and your daughter in the right direction. A good pointe shoe fitting should at least take an hour. The staff member helping you should have your daughter trying on multiple pairs of pointe shoes and asking how each one fits and feel when your child is flat footed and on pointe (her toes). This employee should also give you, the parent, a detailed lesson involving the correct ways to attach elastic and ribbon to the pointe shoes. This information is very important, for it can help ensure that your child will not injure herself while wearing the shoes. After this process is finished and the correct pointe shoes have been obtained, have your dancer try on her pointe shoes for her instructor. Because the instructor knows the dancer and her abilities better than the store employee, he or she will be able to ensure that you have obtained the right shoes for your dancer. Once the approval has been received, you can attach the elastic and ribbons and send your litter dancer off to pointe class. Because of the creation of YouTube, it is now possible to see routines from every dancer around the world. You can witness amazing dances from Canada, Japan, Spain, Austrailia, and all over the United States of America. Below, I’m going to list what I believe are the top 10 young dancers on YouTube. Of course this is an opinionated decision, but through these performance videos, you will be able to witness the amazing talent and training that each one of these dancers has been given. Hannah is a 13 year old dancer form the state of Florida. She has been a top YouTube dancer since the age of nine and has multiple videos on posted on YouTube. Hannah began as a competitive dancer at the age of seven but has recently shifted her focus to ballet. She began participating in the Youth Grand Prix (YGP), a huge and well-known ballet competition for young ballerinas around the world, and received a scholarship to the School of American Ballet’s Summer Intensive. Hannah is currently receiving her training at Patel Conservatory and wishes to one day join the New York City Ballet. Paulina is a 10 year old dancer from the Dance Zone in Concord, Canada. Paulina is an extremely talented performer with technique and strength that has been amazing the YouTube audiences for the past three years. Her training includes ballet, acrobatics, lyrical, jazz, tap, and contemporary. Dena’h is a young and very talented dancer that is recognized around the world for her amazing technique and quality of movement. She began her training in the competitive program at Dance Xcel found in Olathe, Kansas. At the age of ten, Dena’h left her childhood dance studio and moved to Michigan to train under the well known choreographer, Tokyo, at Steps Dance Academy. Since then Dena’h has traveled around the world assisting Tokyo and performing at national dance conventions. With all of the connections this young star has made, it is obvious that she has a very bright future ahead of her. Is a young hip hop star that is making a huge name for herself in the entertainment industry. She has received the honors of dancing in Step Up 3D, Justin Bieber’s music video “Somebody to Love”, Shakira’s music video “This Time for Africa”, Nick Jr.’s “The Fresh Beat Band”, Selena Gomez’s music video “I’m Gonna Arrive”, the MTV Music Awards, and the Vh1 Hip Hop Honors Award Show. Simi, as she likes to be called, began her training at Initial Existence At Master Ballet Company in Arizona. Since then, she has traveled around the country receiving various training in the genres of hip hop, ballet, jazz, lyrcial, and contemporary. Christina is another young star that is not only making a name for herself in the competitive dance world, but also in the world of ballet. She began her training at Murrieta Dance Project in Murrieta, California at the age of eight and has been there ever since. At this well known studio, Christina has been given many opportunities to perform various solos and dance with some of top young stars in the competitive dance world. Not only is Christina recognized as one of the top competitive dancers in the state of California, but her recent success in the Youth Grand Prix (YGP) has also established her as one of the top young ballerinas in the United States of America. Christina’s ultimate goal is be a part of the entertainment industry, and she continues to work for this goal by participating in dance, acting in plays, and competing in vocal competitions. Kaitlyn is a dancer that is easily recognized across the United States of America. While she may not be as young as these other stars, Kaitlyn, at the age of 18, is the “one to beat” in the senior division. She has received numerous titles including the title of Female Senior VIP winner at JUMP’s National Convention and is expected to be seen on “So You Think You Can Dance” in the very near future. Kaitlyn been training at Initial Existence At Master Ballet Company in Arizona since the age of 14. With this training, Kaitlyn has been easily recognized for having the best strength, control, and quality movements in her age division. Brianna is another young dancer from Murrieta Dance Project in Murrieta, California. Since the age of seven, Brianna has been seen as a YoutTube star and continues to amaze audiences with her strength and skill level. She has won numerous first overall titles at state and national competitions and raises the bar during every performance. It has been said that Brianna Haire is definitely a name to watch for in the dance industry. Alexa is a teen dancer that trains at Initial Existence At Master Ballet Company in Arizona. Over the past few years, Alexa and her amazing dancing style have become much more recognized throughout the dance community. She has received numerous honors at various dance competitions and conventions and was recently named the Cover Model Search winner of Dance Spirit Magazine. Alexa is another young star that is expected to hit the “So You Think You Can Dance” stage in the near future. Hayden is a young YouTube star that trains at Allegro Performing Arts Academy in Kent, Washington. Hayden is one of the few young dancers that choreographs her own routines. Because of this, Hayden is not only an amazing young performer, but she is also an up-and-coming choreographer. Stephanie is a 13 year old dancer from Dancer’s Edge in California. Her technique and dance maturity sets her apart form other dancers within her age division. She is well known for her flexibility, extensions, quality of movement, and emotional execution. Please click the link above to access my Millennial Generation Project. The Millennial Generation was not something I had even heard of until this assignment was given. I have heard references to the Baby Boomers and Generation X, but discovering that I, myself, was part of a unique generation was both informative and enlightening. I enjoyed learning about the different ways the generations had developed and how each development affected the generation’s known qualities and characteristics in the work place. It was also interesting to see the breakdown of my own generation’s characteristics and what scholars believed society would be like when the Millennial Generation is put in charge. When learning about the different characteristics that define my generation, it was very interesting to see how large of an influence technology has had on us. Because we have been exposed to televisions, computers, video games, cell phones, MP3 players, and other electronics for most of our lives, we are not only much more tech savvy that the previous generations; we also seem to have shorter attentions spans and the need to have something entertaining us 24/7. I, myself, can attest to this fact, for when I’m bored in lecture, sitting in the doctors office, or even riding as a passenger in the car, I feel a strong urge to pull our my MP3 player or cell phone and entertain myself. While I see this quality as being more of a hindrance that beneficial, many of the articles I read claimed that it could actually be a good thing for our generation. They believe that this form of entertainment has opened up new doors for teaching by allowing people to retain information through media. Movies, music, computer games, and the internet are now often used to teach lessons and present new ideas to students of the Millennial Generation and those in the following generations. The articles also claimed that our strong interaction with technology has allowed us to practice multi-tasking and learn information at a much quicker pace. They believe that this form of training could help future generations to obtain a stronger and more in-depth education. All of this information fascinated me, for I truly believed our obsession with the media would have more of a negative affect on us. As a generation, we spend much less time reading and obtaining useful knowledge than previous generations, and instead, we focus our spare time on television, video games, and the computer. I also question the supposed benefits of quick learning, for when children quickly memorize something, they often forget the information they were supposed to learn. I believe that this can also be attributed to our obsession with media, for through the computer and television, we often gain useless information that we immediately discard when it is no longer needed. By teaching our brains to discard information that is not currently being used, we are stopping ourselves from retaining half of the information we should throughout our educations. I also find it funny that while I am debating the positive and negative affects of an abundance of technology and media in the Millennial Generation, I am working on this project and using media to present it. As a student, I can definitely say that it is much more interesting and less stressful to present a project through a powerPoint than through a paper. I know than I have come across many parents and teachers that would strongly disagree with my statement, but being a part of the Millennial Generation, it is something that I have grown up with and, therefore, am accustomed to. Having the ability to be creative in your presentation, show pictures, and add in videos makes the project more fun and interesting. The only regret that I have is that I do not have Microsoft PowerPoint. Because of this, presenting my project becomes much more difficult. While I do have a program similar to Microsoft Word (called OpenOffice) that creates PowerPoints and other presentations well, sending it to another person tends to become a huge problem. Because they do not have the same program I do, the presentation they open will often have funny formatting and be very difficult to decipher. The only solution I have is to turn my PowerPoint into a PDF file; however, while this does a good job at maintaing the format of my initial presentation, it does not present it in the form of a powerPoint and much of the creativity initially put into the presentation is lost. Learning about the Millennial Generation has been very enlightening. It showed me why many people in my generation work the way they do and gives me some insight into what the future may hold. I’m very interested to see how the rapid advancements in technology will have on future generations, for if our generation was that defined by it, I can only imagine what it may do for them. Hopefully, the affects will be highly beneficial and create a world much better than ours. On Friday, November 26th, the Grand Rapids Ballet Company held their opening performance of “The Nutcracker” at the Detroit Opera House. This performance, filled with fantasy and child-like wonder, is Tchaikovsky’s classic ballet that has become a traditional part of the Christmas holiday for many American families. In this production, the director, Patricia Barker, made sure that the magical essence and graceful beauty found within the story of the young child, Clara, and her Christmas present, the Nutcracker, held the leading role of the ballet. The story began with friends and family making their journey to the Christmas party being held at Clara’s home. As the dancers walked across the stage, each parent and child brought forth a strong character that made the rest of Act 1 much more interesting to watch. It held snooty little girls, rambunctious boys, a goofy and somewhat flirty grandfather, and the ever-mysterious giver of the nutcracker, Councilor Drosselmeyer. As the party begins, each child is given a special present from under the giant, magical tree. The girls receive elegant dolls which they hold with great tenderness and care; where as the boys receive toys riffles allowing them to play in such a way that young boys do. As the party continues, a dark, mysterious figure arrives causing many of the party’s participants to show faces of concern and fright. Relief and joy is shown when this unknown character reveals himself to be Councilor Drosselmeyer, the godfather of Clara and her brother, Fritz. the precious toy, the mood of the party begins to decline, and the numerous guests being their journey home, leaving in the same matter in which they came. When the grandfather clock strikes 12, the true magic of this show begins. Clara, who should be in bed, enters to play with her beautiful nutcracker and ends up falling asleep in her grandmother’s favorite chair. As her dreams take over, adult and children mice come out to play and wreak havoc within the house. In order to save Clara from these mice and their evil Rat King, the precious nutcracker becomes life size and gathers soldiers to fight the evil mice away. This battle scene is one that is seen in every version of the Nutcracker ballet; however, the Grand Rapids Ballet Company brought true magic to it. The mice were costumed with grey bodies and giant mice head pieces, and the soldiers were given the toy weapons of spark-shooting cannons and polished riffles. As the battled ensues, the Rat King and the Nutcracker fight head to head to achieve victory. The Rat King soon gains the upper hand by severely injuring the Nutcracker; however, when it seems all is lost, Clara comes to the rescue and kills the Rat King by hitting him over the head with her shoe. Once the battle is finished, Clara begins to morn for the loss of her precious nutcracker. Too distracted by her grief she fails to see the magic that is taking place around her. Smoke created from dry ice surrounds the body of the fallen Nutcracker and within seconds, a healed and real-life Nutcracker Prince emerges. This particular scene was by far one of the more magical moments throughout the ballet. I have attended many Nutcracker performances, and Patricia Barker’s approach to this scene was the best I have seen so far. The prince emerging from the smoke made the magic of the story seem much more real, and sitting in the audience, you could hear the excitement and awe from all of the children watching. After the prince collects Clara from her grief, he decides to show his gratitude by taking her to his magical kingdom. They head off in a sleigh being guided by some of the cutest angels you will ever see and pass through the land of wind and snow. Many of the Nutcracker ballets I have attended have only made “snow” a part of the journey so seeing the dancers perform as “wind” was a new experience for me. I did, however, enjoy it, for I felt that it was a nice contrast to the softness of the “snow” choreography. The “wind” choreography was made to be much more strong and harsh by the addition of sharp arms and multiple leaps throughout the routine. Once the magical kingdom was reached, the Nutcracker Prince introduced Clara to the people of his land. There were the Spanish Hot Chocolate, the Arabian Coffee Princess and her court, the Clowns, Mother Gingerbread and her Bon Bons, the Chinese Tea, the Flowers, the Reeds, and the Russian Candy Canes. Each group performed a routine of thanks to show Clara their gratitude for saving their dear Nutcracker Prince. The Queen and King of the land, the Sugar Plum Fairy and her Cavalier, also took part in a long performance that many people view as the highlight of the entire ballet. In this performance of the Grand Rapids Ballet, Dawnell Dryja held the role of the Sugar Plum Fairy. Her precision and technique was beautiful to watch in this challenging role. While there were a few small fumbles during the lifts, her amazing turns and performance quality more than made up for it. Once the performances were finished, the people of the Magical Kingdom said their goodbyes to Clara, and she was taken home by the Angels guiding the magical sleigh. As Clara awakes in her grandmother’s favorite chair, everyone begins to wonder if the magic that seemed to take place was true. While this question will continue to linger within the minds of the audience, the answer does not matter, for the magical moments they experienced will remain in their hearts and minds regardless. The focus of my survey was extracurricular involvement. I wanted to see the effects, both positive and negative, extracurricular activities had on a child’s social life and academic performance, and if, in the end, their participation was more beneficial or harmful. There are varying views on this topic, for some people strongly encourage participation in clubs and sports while others frown upon it. Those supporting it believe that these activities help children to learn responsibility and gain confidence, and those against it often claim that loading a child with extracurricular activities can burden them with unnecessary stress and pull their focus away from school. In order to gather an idea about which view is more accurate, I conducted a survey that targeted parents with children between the ages of five and eighteen. I asked their child’s age, activity level, academic performance, social characteristics, and if they are affected by any social or behavioral disorders. I wanted to see how these extracurriculars affected both the average child and those suffering from disorders. Through my data, I was able to gather that children who participated in extracurricular activities did not only have stronger academic performances, but they were also more socially developed and strongly displayed the characteristics of friendliness, humor, and responsibility. Sixteen people took part in my survey focusing on children and the effects of their involvement in extracurriculars. The first questions my participants were presented asked if they were the parent or guardian of a minor and how old their child was. All but two participants confirmed that they housed a minor, and the ages they listed ranged from eight to seventeen. I felt that it was important to see the age of the child being observed, for social development and academic performance is judged differently at different ages. Those who are below the age of ten are not as expected to display the same amount of responsibility as those above the age of fourteen. This distinction also helped me to see how extracurricular involvement effects children of varying ages. Once the ages were established, I asked the participants if their child suffered from some form of learning or behavioral disorder and what that disorder was. This data allowed me to see if extracurriculars affected those children positively, and if it could possibly help them to treat or gain control over their disorders. Out of my sixteen participants, three parents confirmed that they had a child suffering from some sort of disorder. Two were diagnosed with ADHD, and another confirmed that their child had been diagnosed with a high IQ at a young age This diagnosis led to atypical social development. The next topic approached was the child’s involvement in extracurricular activities. All but one of my participants responded to this question, and 93.3% confirmed that their child was actively involved in extracurriculars. Out of this group, 14.3% were involved 0-5 hours per week, 28.6% were involved 5-10 hours per week, 21.4% were involved 10-15 hours per week, and 35.7% were involved in extracurricular activities more than 15 hours per week. In addition to that, two out of the fourteen participants that confirmed their child’s extracurricular involvement had children suffering from a social or behavioral disorder. Both of these participants believed that the extracurriculars benefitted their child and claimed that they “help[ed] with self-esteem” and “[gave] their [child’s] mind something to [focus] on.” By filtering this data, I was able to see that a majority of those children participating in extracurriculars had better better academic performances than those who were not. 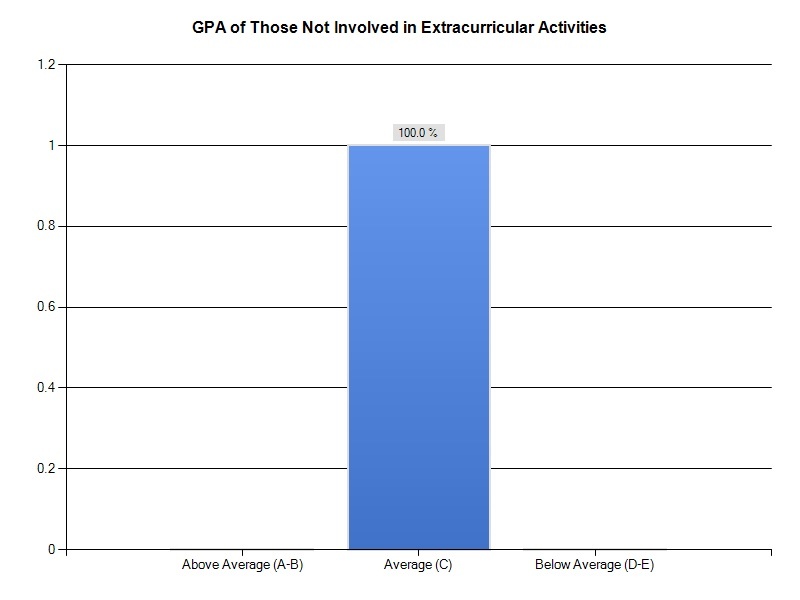 Following this are two charts which break down the academic performances into those who do participate in extracurricular activities, and those who do not. 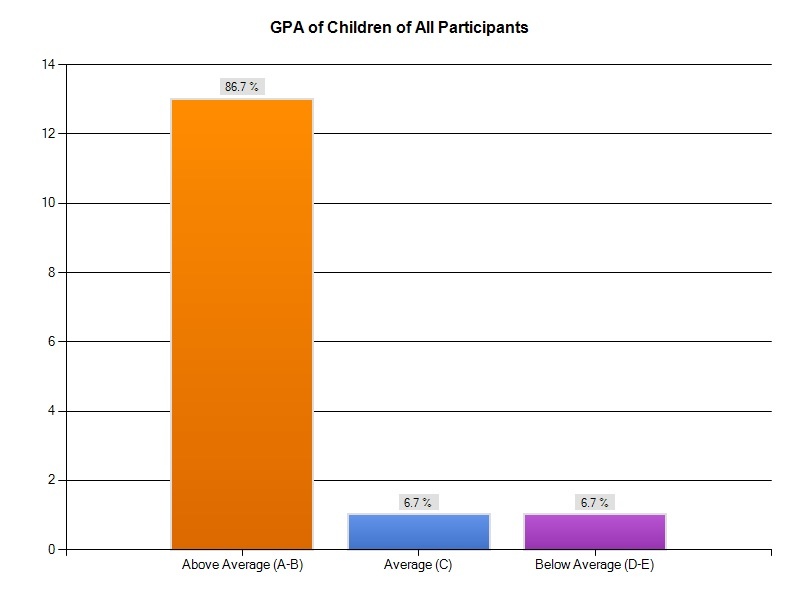 While there may not be a large amount of children representing those who do not participate in extracurriculars, the large percentage of children that participated in extracurriculars and were described as having an “Above Average” academic performance strongly supports the claim that extracurricular involvement will academically benefit a child. Social development was the next topic discussed in the survey. I wanted to see if a child involved in extracurriculars will socially develop differently from those who were not involved. Based on the children who do participate in extracurriculars, the three dominant characteristics were friendliness (92.9%), humor (78.6%), and independence (78.6%). Other characteristics strongly represented were being a “people-please”(57.1%), studiousness (50.0%), being easy-going (57.1%), responsibility (71.4%), being a high achiever (50.0%). (See Chart Below.) Many of these characteristics represent social qualities that are important for life. They also support that claim that extracurricular involvement encourages responsibility and confidence, for each of the strongly represented characteristics listed above support one of the two. Because I only had one participant confirm that their child was not involved in extracurricular activities, I am unable to compare the socially developments between those who are involved in extracurricular activities and those who are not. This child showed a wide variety of characteristics; however, a single child’s characteristics cannot accurately represent a group. Other questions asked were: “Approximately, how many hours a week does your child devote to the T.V., computer. or video games?” and “What type of school does your child attend?” These questions can help to see other components that may affect a child’s academic performance and social development. The majority of the children, 53.3%, attended public schools, 26.7% attended private, and 20.1% represented other. The amount of television watch varied greatly amongst the groups, ranging from 2 hours a week to 15 or more hours a week. I thought it was quite interesting to see the amount of time child devote to extracurricular weekly and their corresponding grades. 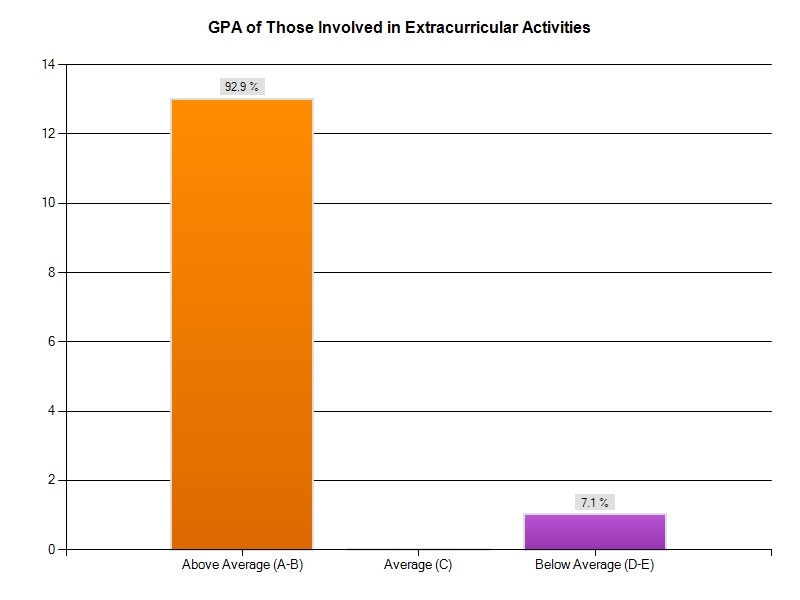 Surprisingly, all of those who participated in ten or more hours of extracurriculars a week were described as having “Above Average” academic performances. 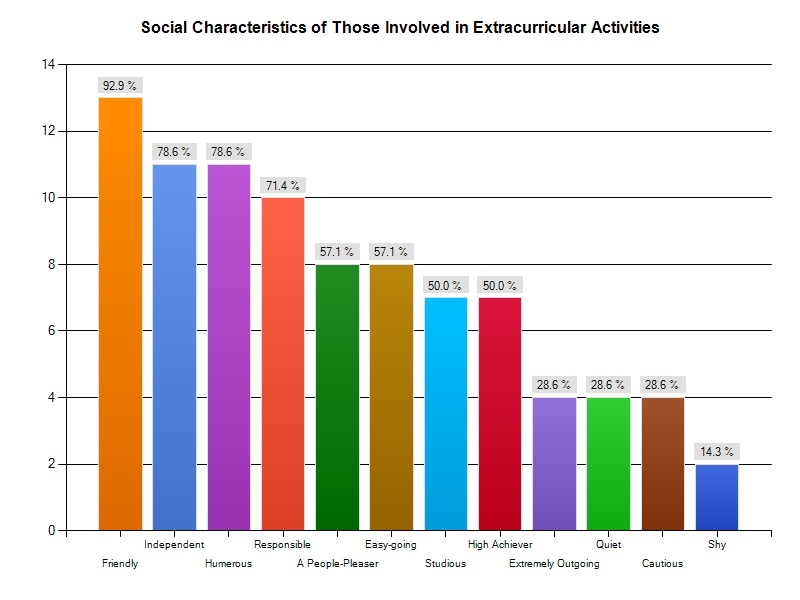 It was also interesting to see that dominant characteristics developed in those who are involved in extracurriculars. The biggest disappointment within my survey, was the lack of participants representing children that did not participate in extracurricular activities. While the data I received was able to partially support the claims I desired, the data could not be considered accurate. If I were able to do the survey again, I would make sure that I had more participants in total and more participants to represent the non-active group. I would also like to have more participants with varying social and behavioral disorders. Because I only had three with confirmed disorders, I was not able to gather any data that could support any trend between the disorders, social development and academic performance. I believe that doing a study on the effects extracurricular involvement has on the treatment and control of social and behavioral disorders could be very interesting and beneficial.